LANCASTER – In the past couple of weeks the Antelope Valley Mosquito & Vector Control District (AVMVCD) has been getting several calls per day from residents of the Antelope Valley complaining about “swarms of mosquitoes” that are covering their cars, walls, screen doors and windows. Both mosquitoes and midges need water for their development and can occur in the same places, such as ponds, ditches and basins. But midge larvae burrow down into the mud, while mosquito larvae are at the water surface. The adults are very similar in size and appearance, yet the midge lacks the mosquitoes’ signature proboscis – the needle-like mouth – that is needed to bite. 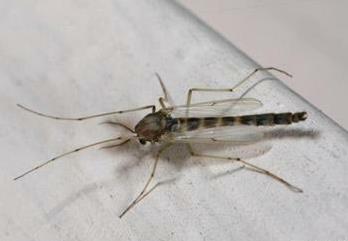 Another difference is that midge wings are shorter than the body, whereas mosquitoes have longer wings. Although midge swarms are a nuisance, they do not bite or transmit diseases, and they will be gone in a few weeks. To reduce the numbers of midges at a home, turn off outside lights or change the bulbs to yellow “bug lights”. Commonly used bug zappers are also not recommended for either midges or mosquitoes; they tend to attract more insects than they kill, which results in the opposite effect than desired. For any further questions or services, contact the Antelope Valley Mosquito & Vector Control District at 661-942-2917 or visit www.avmosquito.org. 2 comments for "‘Mosquito swarms’ are actually midges or gnats, experts say"
Got caught in the 14 fwy swarm on my motorcycle the other day. Not fun at all. There are literally millions of them. I have a yellow bug light and they are still hanging around and they seem to like that yellow light…..Can’t wait until they are gone pest…..